The air we breathe in Lee County has improved significantly since 2005. The amount of toxic air pollution released in Lee has dropped by about 80 percent since 2005, according to the most recent data available from the Environmental Protection Agency’s Toxics Release Inventory program. 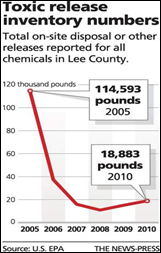 In 2005, the EPA’s TRI program reported the total on-site toxic releases for all chemicals in Lee County was 114,593 pounds. By 2010 – the most recent year figures are available – that number had fallen to 18,883 pounds. The releases were allowed under permits the companies were required to obtain from the Florida Department of Environmental Protection. TRI contains data on disposal or other releases of more than 650 toxic chemicals from thousands of U.S. facilities and information about how the facilities manage those chemicals through recycling, energy recovery, and treatment. The EPA stressed information gleaned from the TRI database reflects releases and other waste management activities of chemicals, not whether – or to what degree – the public has been exposed to those chemicals. In Lee County, toxic chemicals noted included styrene, formaldehyde, methanol, phenol, mercury and naphthalene. The EPA says formaldehyde is a chemical used by industry in manufacturing. It is a colorless, pungent-smelling gas that can cause watery eyes, burning sensations in the eyes and throat, nausea, and difficulty in breathing in some humans exposed at elevated levels. High concentrations may trigger attacks in people with asthma. In 2005, companies listed as releasing these substances in varying amounts included Munters Corp., the Fort Myers power plant, HPBC Inc. and Corinthian Marble. Munters, which makes systems for removing contaminants from industrial emissions, was listed in 2005 and 2006 for the release of phenol, methanol and formaldehyde. The company had an air permit that allowed for the release of specific levels of such toxins during the manufacturing process.